Workshops: April 16-19, 2–4 pm Performance: Saturday, April 20, 2 pm This school-vacation program will introduce upper-grade elementary students to improvisational comedy (“improv”). 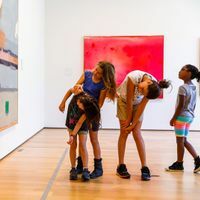 The four workshop sessions will include engaging with art in the galleries, playing classic improv games and developing original scenes inspired by the Clark collection, with a culminating performance for friends and loved ones. The program will be led by Amanda Bell Goldmakher, Clark art educator and a graduate of the People’s Improv Theatre in New York City. All materials and a daily snack will be provided. Enrollment is limited to 8 children.